I was a little disappointed that we've lived in the countryside for nearly six months and have not seen any wildlife yet. However, it seems as though a lot of the wildlife is finally starting to come out! My husband and I were driving to Walmart the other day, and on our way there, we saw two deer hanging out on someone's front lawn. The house was located right next to a heavily forested area, so they hung around for a few minutes, (long enough for us to snap some pictures!) then began trotting away back into the woods. 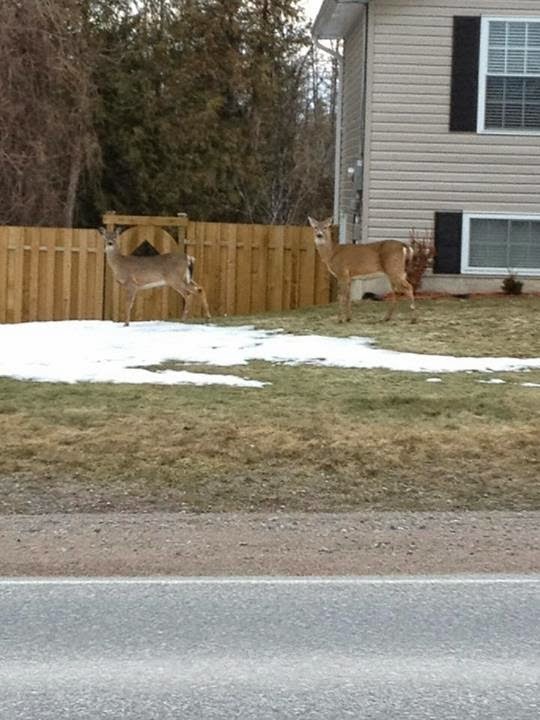 My first time seeing a deer was last summer, when we saw one crossing the road on Manitoulin Island. Later that same summer, we saw a family of about five deer in a parking lot in Mont Tremblant. A few days ago, I looked out the window and saw some movement in the water. It was a long furry animal, swimming to and fro. I'm not sure exactly what it was/is, a weasel, muskrat, otter or something of that family I would presume. We keep seeing this little guy swimming around several times a day. 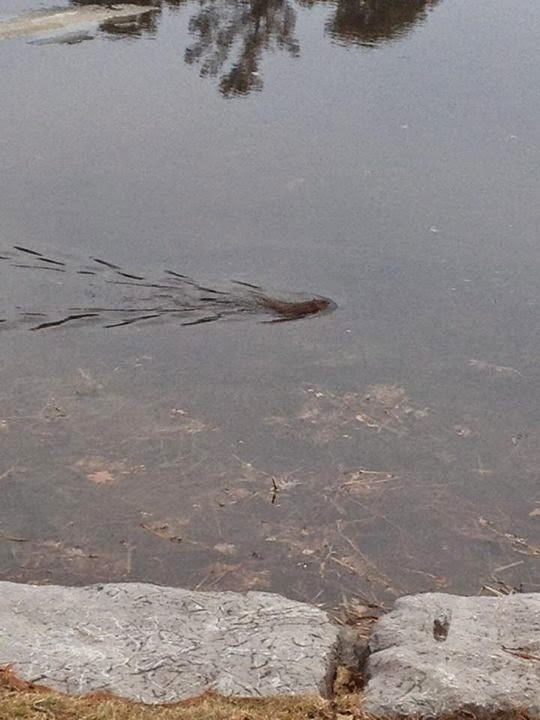 At first, I thought it was a beaver, but it was too small and it's tail was long and pointy, not big and flat. Today, we even saw it jump out of the lake and hang out on the lawn for a bit! We are also starting to see ducks swimming and flying about. But these ducks/birds are not like any other birds I've seen before. I don't know if city birds are different from country birds, but I've never seen black and white ducks in Toronto before! There's something pleasant about seeing animals in their natural habitat, as opposed to be caged up in a zoo. They are cute and peaceful to watch. It's fun to observe them, enjoy them, and let them be.